The Pentagon's Missile Defense Agency (MDA) has decided that four sites will be evaluated. The MDA has not yet made the decision to proceed with construction of a new missile defense site. It is expected to take approximately 24 months to complete the EIS. The EIS will assess environmental impacts at each of the sites, to include potential impacts to land use, water resources, air quality, transportation, socioeconomics and other factors established by the National Environmental Policy Act (NEPA). Public involvement is supposedly encouraged as part of the process, to include public meetings, written comments and public review of the draft and final documents. There are several types of "missile defense" systems today. Some are on Navy Aegis destroyers (testing quite successfully), some are deployed on Army mobile launchers, while the GMD system is based underground. 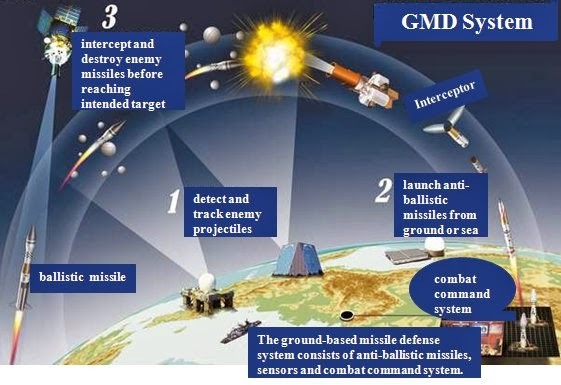 The GMD system, whose mission is to have an interceptor missile hit an "enemy" nuclear missile in deep space, has not had any real success in their testing program - many of the tests have been scripted to appear successful. A new GMD site could cost more than $5 billion to build. Boeing manages the GMD program while Raytheon and Orbital Sciences Corporation build the interceptors ('kill vehicles') and the rockets. These "missile defense" systems are key elements in US first-strike attack planning. Each year the US Space Command runs a computer war game where China and Russia are attacked with hypersonic global strike weapons that attempt to take out their nuclear capability. After that initial attack China or Russia would attempt to fire their remaining nuclear forces at the US. It is then that the triad of US "missile defense" systems (ship-based, mobile, and GMD) would be used to pick-off those retaliatory strikes. One should call "missile defense" the shield that is used after the US first-strike attack sword lunges into the heart of China or Russia. This is what the Pentagon and the Missile Defense Agency are now developing. Maine State Rep. Andrea Boland (Sanford) told me last week that North Korea, Iran and Russia are eager to attack the US. The liberal Democrat wants this GMD base in our state. Better us, she told me, than someone else. I don't see it that way. The aerospace industry in Maine wishes to expand their operations across the state....this GMD site appears to be their major effort to make a big splash. Now is the time for public outcry against this East coast GMD site. Activists in Maine, Ohio, Michigan and New York must speak out against the madness of US first-strike attack planning and the colossal waste of our $$$$$ at a time of austerity cuts in social spending. In the end "missile defense" is destabilizing as it forces China and Russia to make counter-moves that are then used by the Pentagon to justify even more of these kind of programs. New arms races are fueled by deployment of so-called "missile defense". It truly should be called missile offense.